The 1/4 ounce Krugerrand is The third largest of all standard Krugerrand weights, the others being the 1oz, the 1/2 oz and the 1/10 oz. Introduced in 1980, thirteen years after the 1oz was first minted, it was among the most popular gold bullion coins of the era, with Krugerrands in general making up 90% of the global gold bullion market. 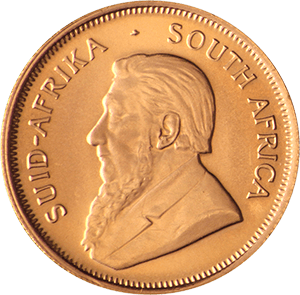 The 1/4 ounce Krugerrand itself has a diameter of 22.06mm and thickness of 1.888mm. It’s purity measures 22 carats, only slightly behind the very purest 24 carat gold bullion of a handful of government minted coins. It has a reeded edge and its gold content weighs 8.482g. 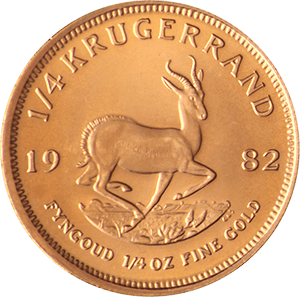 Due to competition in the gold bullion market, Krugerrands are no longer as dominant as they once were in the 1970’s, They are still highly sought after by investors in all four corners of the globe, however. This is partly due to the fact the coin remains such an iconic item. Gold bullion is one of the safest investments of all precious metal products. Government minted coins, which are of the highest purity and quality, are particularly secure. Unfortunately, forgeries are still common, so dealing with a reputable vendor is of the highest importance. Goldinvestments.co.uk has many decades experience in the sector and, unlike many online traders, we have a physical office in the heart of London, from which we are happy to give advice on all precious metal investment.